We make your brand shine. On the shelf and in the pharmacy. Now Available: Laser Or Thermal Label Options. 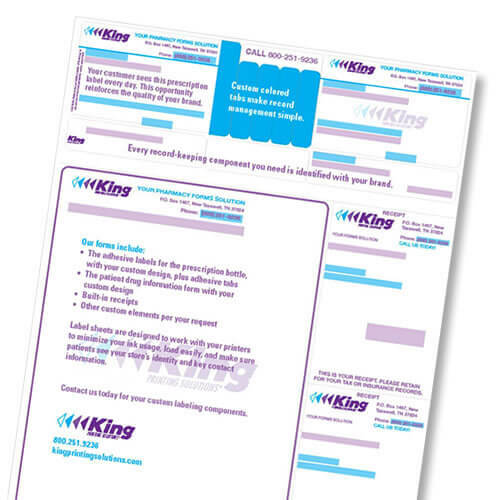 King Printing Solutions provides pharmacy and personal care labels for off-the-shelf items and custom-printed dual web forms for use in the pharmacy. We also work with many pharmacies to print customized prescription drug labels and information forms (both in laser or thermal formats). Our exclusive KingScript forms provide exceptional quality and performance. Our unique process uses a combination of hot/cold glues to make our forms more stable than others. That means they run through your printers better, with fewer jams and less wear and tear. Labels don’t start to come loose before you peel them off. And printer heads stay cleaner, meaning less maintenance and downtime. Our label sheets work well with most printers, help minimize your ink/toner usage, and make sure patients see your store’s identity and key contact information. Since your labels and information forms are often seen daily by your customers, the right custom form is perhaps the most important thing you can do to maximize your store’s brand impact. Now Available! Get vials, bottles, and other pharmacy supplies from one of the industry’s leading resources.